Recemente comprei um tablet Glow 9.7 (à venda na FNAC) e, depois de uma pequena investigação, descobri como “fazer root”. Executar a aplicação de update, disponivel na secção “Settings”. Escolher local update e escolher o ficheiro .zip. Depois, é só reiniciar a máquina. Entretanto, parece que puseram uma pagina simpática com a explicação de como actualizar para a ultima versão “oficial” (Android 4.4). E depois disso, é muito fácil fazer root com o King Root. E pronto. Hi buddy. I’ve just got the Glow 9.7 in Spain, and this is the only information that I have found all across the Internet about how to root it. So I’m just wondering if you have tested it personally and you can guarantee me that it works properly, because I’m a little bit affraid of it, Thanks in advance for your help! The first thing to know is that this is just a rebranded Onda V975 (Chinese) tablet. With this information you’ll be able to find a lot more about it. As for my experience with it, I’m generally satisfied (especially after rooting it), but I’m not so happy with SPCinternet. I’m not happy because they promise sw updates on their website, and none has been delivered until now. Thank you very much for your help and your quick answer. I’ll check the Internet looking for some extra information with the Onda issue. That will be really useful, because I couldn’t find anything at all so far. Regarding the updates thing, I hope SPC will launch something sooner than later. One last thing. Will I lose all the data after rooting the tablet? Or the process does not affect the data? You shouldn’t lose anything. When rebooting, if it appears that the tablet is frozen or on a loop, just do a hard reset by pressing the power button until it reboots. About the updates, yes I do hope, but I don’t expect as much. Wow!!! Frozen, loop… That really scares me… I need to think about it… Because, I will lose the manufacturer guarantee, right? You’ll lose it by rooting, yes. If you’re not comfortable with it, you probably shouldn’t do it. On another note, can I ask you a favour? 🙂 If yes, I’ll ask by email. What can I do for you from the distance? So sorry man, but for security reasons I can’t open that mail, so if you don’t mind, let me know right here. I guess there’s nothing so bad that you cannot say using your own web. Thanks for helping (or at least trying). I accidentally deleted all the content that came from SPC, like the videos and stuff. Would you be able to send that to me? Maybe in a zip file with google drive? If not, we can try other methods. Hi again. I don’t know what exactly do you mean and I don’t even know how to do that. I don’t have a copy of the stock rom. It’s not a copy of the stock rom, it’s a copy of the contents on the virtual “sdcard”. But don’t worry, I don’t really need it, it was just to get a backup of it. Anyway, if you’re not comfortable with rooting, may I ask why do you even want to do it? I really would like to get my tablet rooted. That’s why I was looking for some info about how to do it. I’m just a bit worried about the possibility of something going wrong with a two-weeks old device, specially after losing the manufacturer guarantee. Ola. 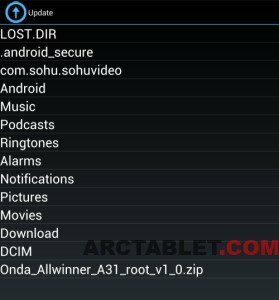 Estava a pensar fazer root ao meu spc glow 9.7 para poder instalar uma rom android 4.4, visto que tais updates ainda não aconteceram. Gostaria só de saber se saberias onde encontrar rom’s para o spc. Obrigado. Não conheço nenhuma ROM para o Glow, mas há várias para o Onda descrito no post. Uma pesquisa no nosso amigo Google poderá ajudar. Já tenho estado a fazer pesquisa em relação aos modelos da onda e reparei que o onda v975 tem 1gb de ram enquanto o spc tem 2gb. Se não me engano o que se aproxima mais é o onda v973. Boas chegaste a meter alguma room? Posso meter alguma room do v975 ah problema? Boas pode se meter uma room do v975 eh possivel? Ainda não a instalei porque o processo parece não se dar bem com Windows 8.1 x64, mas eventualmente vou tentar num Windows 7 32 bits. Olá. Eu já instalei a versão oficial da spc. Nota se algumas melhorias, mas também me tem estado a dar alguns problemas. Uma coisa minima, por exemplo, sempre que carrego numa hiperligação o rebordo do ecrã fica vermelho. Já agora, a vossa dá-vos algum problema a carregar? Do género se a posição do cabo mudar ela deixar de carregar. hey guys, i have the glow 9.7, and i ran the update to 4.4.2 from SPC, but after reboot the wifi wont turn on, tried several factory resets, but didnt work :/ is there any way to get the 4.2.2 rom back on there? Hi Daz. Mind that there are two versions of tablet, so take that in consideration when updating the firmware. I believe you can find all the firmwares here: http://ota.spcinternet.com/firmware/. Next PostNext Yay for cider!